Hey, party peeps! You’re going to LOVE today’s DIY tutorial! It’s easy, it’s fun and kids LOVE them. 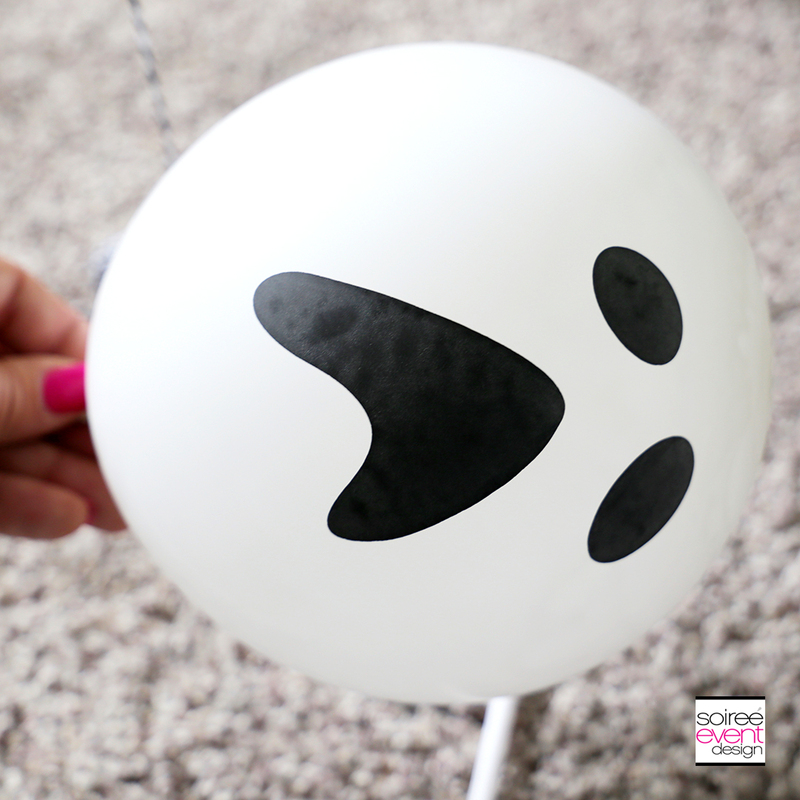 Add these DIY GHOST BALLOON FLOATERS HALLOWEEN DECORATIONS to your Halloween Party decorations and see for yourself how fabulous they are. They were perfect for my latest BOO BLACK AND WHITE HALLOWEEN PARTY. Be sure to check it out. This post was sponsored by Oriental Trading with either payment and/or product to review. All opinions are my own as I ONLY promote brands that I LOVE and actually USE. 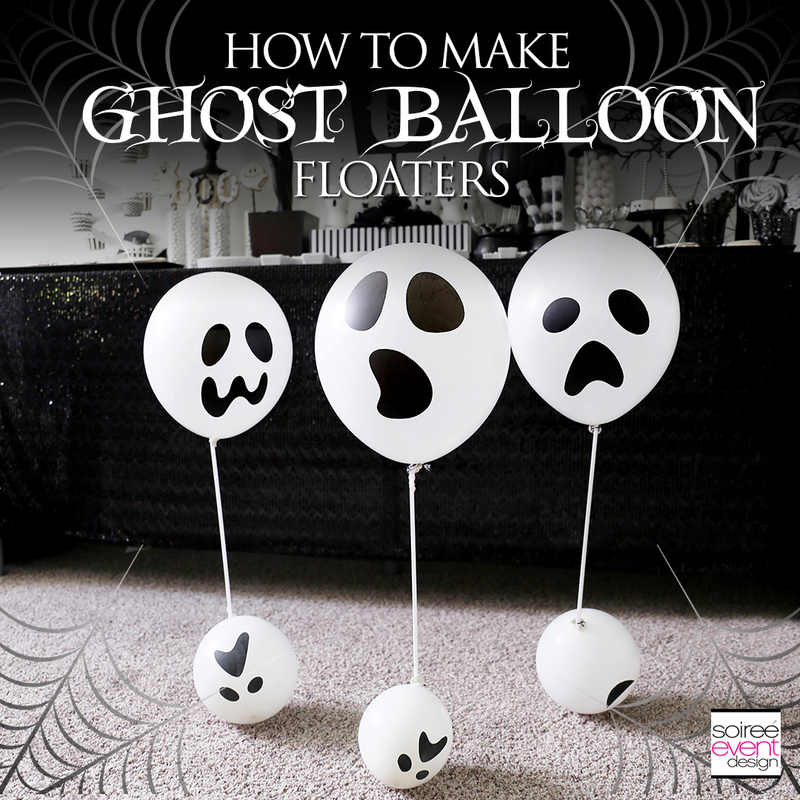 LET’S MAKE GHOST BALLOON FLOATERS HALLOWEEN DECORATIONS! I actually used to buy these in solid colors at a local balloon shop here in my town that since went out of business. Kids loved them so much that I decided to make a ghost face version of them myself since I couldn’t buy them anymore. They are super easy with a few supplies from Oriental Trading. Want to see how to make them? Let’s get started! STEP 1: FILL ONE BALLOON WITH HELIUM! Fill one of the ghost face latex balloons with helium and tie the end. STEP 2: FILL ANOTHER BALLOON WITH AIR! Next, blow up another ghost face latex balloon with air. Filling it a lot smaller than the helium-filled one. (as shown) Tie the end. STEP 3: ATTACH THE BALLOONS TO THE CRAFT STRAW! 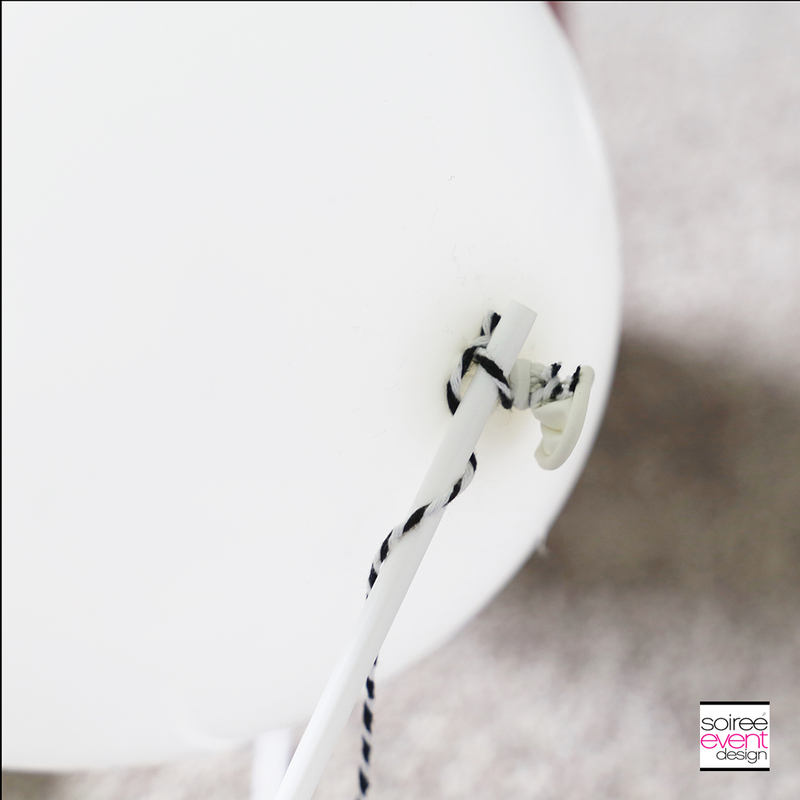 Using the black and white twine, attach the tied end of the helium-filled balloon to one end of the plastic craft straw and the smaller air-filled balloon to the opposite end of the craft straw. STEP 4: STAND IT UP WITH THE AIR-FILLED BALLOON ON THE BOTTOM! The air-filled balloon will prevent the balloons from rising off the floor but the helium one will keep it upright. It looks as if they are floating. Continue to make as many as you want. Place these all around your party space for some spooky fun! The air flow in your house will make the Ghost Balloon Floaters Halloween Decorations move around on the floor as if the ghosts are floating around! Check out how I used them in my BOO BLACK AND WHITE HALLOWEEN PARTY including lots of how-to tips to recreate it yourself. Omg these balloon looks cute and easy to make. I should make some of these for our office halloween kids party. Those are just too cute. What a fun decoration for a Halloween party! How precious! And seriously, what fun are these for Halloween!? These would be cute lined up on the porch! Those are so spooky and cute…and just in time for my favorite holiday – I love Halloween and I’m thinking of throwing a party, so this tutorial is perfect! Those are so cute! I love this idea, and I love the balloons. I’m a big fan of Halloween decor that isn’t all blood and guts and horror. These are so cute and appear simple to make (a requirement for me). I love that they go with your classy black and white theme! Now this looks fun to do! This would be a great party idea. We probably have a Halloween party before too long and I think I want to put this in there as a decoration. I’ve been looking for something to use at our Trunk or Treat. These will be perfect! Those are awesome! I could see so many other ideas from that same technique. What a great little addition to a party. These are going to be perfect for my Halloween party this year. I will have to get the supplies I need on the weekend. What a simple and fun Halloween decorating idea and I love that its all black and white. Those are so cute and fun for Halloween. I love Halloween decorating, especially now that the kids are a little older. Those are so cute! I’ll have to make some of these. They look really easy to make too. I love it! These look so cute! My kids would love balloons like these. This is such a cool way to add to the atmosphere of a Halloween party! I would love to have a couple floating around on Halloween! Super cute idea! I have to share this! These balloons are so much spooktacular fun! I love Halloween decorations that are fun and not-too-scary for smaller children. These are perfect! What a great way to have balloons stand up. These balloons are so spooky. What a great idea … floating ghosts would be so fun for a Halloween party! Oh my Boo! These guys are the cutest things ever! It’s also the perfect Halloween craft for me and my grandkids. This is a really cute idea and not too scare for little kid Halloween festivities. I know my kids would love these so I’ll be making some myself! I always love your party decor! 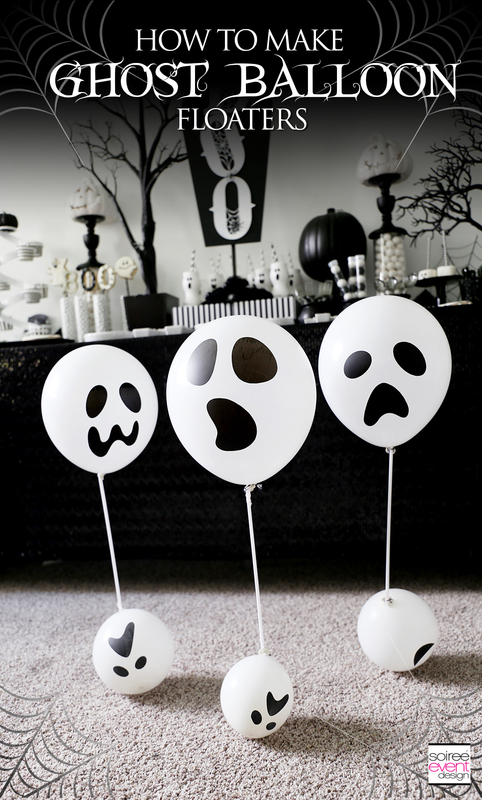 These balloons are such a cute and simple Halloween decoration. how cool! i was just put in charge of halloween decorations and i’m totally making these! I love these! I am going to try this out with the kids they are going to love it TY! Nice decor for a cool little Halloween parties for the kids. I like it. Seems like it is pretty easy to make. So cute! I love Halloween and all of the fun Halloween decorations. This one looks like an affordable and easy one to make. Looks so fun! I would want to make this for a Halloween party! Those ghosts are adorable and they’re not scary at all for the little kids! This is a nice decoration for the house this Halloween! 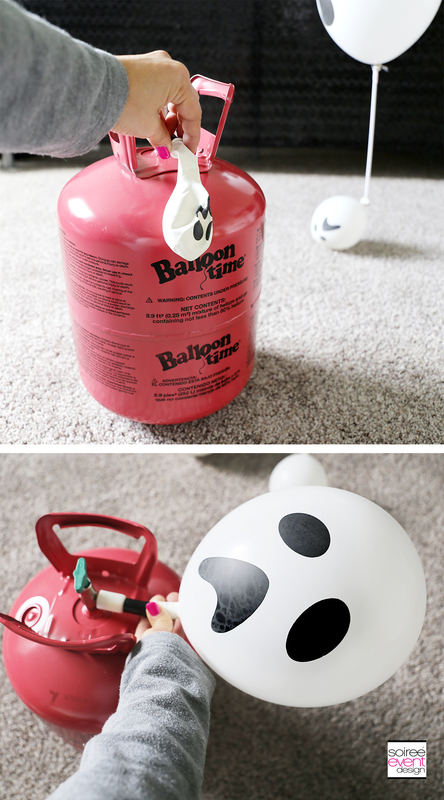 Those ghost balloons are perfect for a Halloween party! My son and I love Halloween decorations, so we will try them for sure..
How fun are those balloons? Balloon Time tanks are so handy and much more cost-friendly. Plus you don’t have to worry about trying to drive home with your car full of inflated balloons! OMG these are totally awesome. I love their faces and having one floating and one not is a brilliant idea!! This is such a clever idea and would be perfect to add to our Halloween decor. Love how this DIY project turned out. What a nice and easy idea for Halloween decorations! Can’t wait to try this! Oh my goodness! How cute are these? You always have the best ideas, these are fantastic and would be a huge hit! What a cute idea! This should be the next thing on my kids’ and I’s project list! Those are adorable. I just found some glow in the dark balloons and that seems to be a perfect way to use them. My little ones love Halloween and balloons. This would be such a fun way to decorate and they certainly would get a kick out of it! Those are so much fun! I will keep this in mind for our next party table! Those are so cute and i just love oriental trading!! They have such cool stuff!! This is a great blog post and such wonderful photos!! This is such a fun craft to DIY for Halloween! I love the expressions on the ghost faces. i love cute and easy ways to add some halloween decor around the house. this is perfect. These are super cool for party decor and the party you have in the background!!! OMG! It is incredible. These are so neat! I’ll have to make a few for the house. What a simple but fun idea! And very easy to make with my daughter! I might not do it for the Halloween as we dont really celebrate halloween but for a birthday party! the balloons are so cool!this is such a cool idea and super fun. You’re so creative. I love this so much! I wish I could come up with such cool ideas. These ghosts are perfection. They would look amazing in the windows of your home too, especially if you lit them up so everyone could see how haunting your home was. These balloons are so cute! The idea is also just in time for halloween! OMG, these are so cute and fun!. Definitely a nice festive touch for a Halloween party or to receive those cute trick or treaters! I saw these in my Facebook feed earlier, and should have known they were your creation! So cute! The kids will get a kick out of these. Those are so cute! What a great Halloween idea. I love their faces. How fun! I bet my boys would love these if we made them for Halloween! Oh, this is perfect! I love the idea of spooky ghosts floating around my house during a party! These are so cute and super simple. Love it! Oh what a fantastic idea! These balloons will definitely get you in the Halloween mood! As halloween is around the corner and we are looking for some halloween decore . These ballons are so cute and will be really popular among kids. You seriously come up with some of the best ideas. I love how these turned out. They would make for great decorations at a party. This is so qute! for a moment I though it was going to be complicated, and I’m glad it was not. this is a great hack for other occasions as well. Those are super cute! I can’t wait to make those with my daughter. 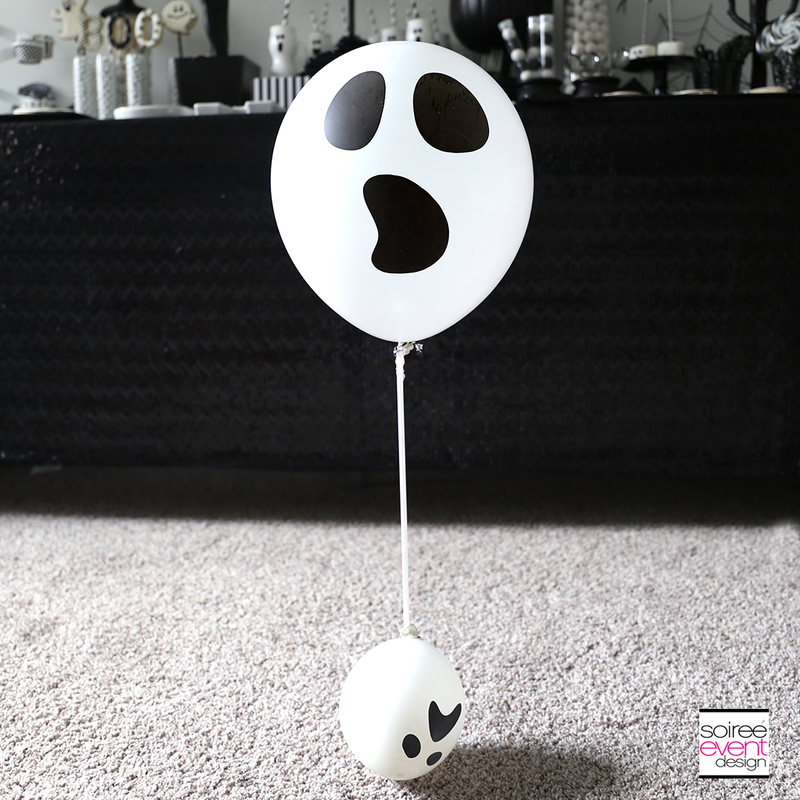 These DIY ghost balloon floaters are an awesome Halloween decoration. They would be great for any Halloween party or for the porch Halloween night. Thanks for sharing the decorations. How great to do for halloween! I can’t wait to try this activity with my grandson! These are so cute! I’m going to make them this weekend! This is such a great decoration idea! I’ve never seen these before, but balloons are always a big hit. Really clever to use an air filled balloon to keep the helium one from floating all the way up!